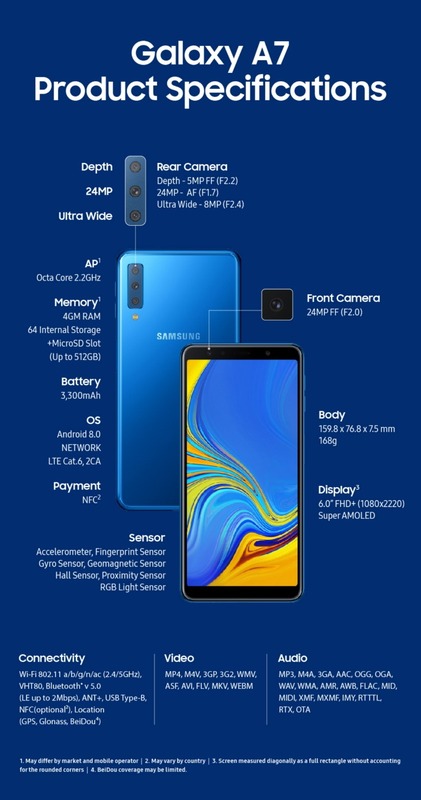 Samsung is committed to delivering meaningful innovation to all consumers across the Galaxy family, no matter who they are or where they are in the world.That’s why we’re excited to introduce innovative new features to the A series with the Galaxy A7, a practical but powerful device that is built to help make your everyday both convenient and extraordinary. The design isn’t something extraordinary as the phone has a similar design language as other recently launched mid-rangers from the company. The Galaxy A7 2018 features a Super AMOLED display with aspect ratio just above 18:9 since the resolution is 2280 x 1080 pixels. The phone has a glass and metal build which looks premium. This time, the company went for a side-facing fingerprint scanner, like some old Sony devices. On the rear, the phone has a vertical triple camera setup and an LED flash below it. The USB Type-C port, 3.5mm headphone jack, and the speaker grill are placed on the bottom. The volume rockers and the fingerprint scanner (that also works as power button) is placed on the right, whereas the SIM card tray is on the left. 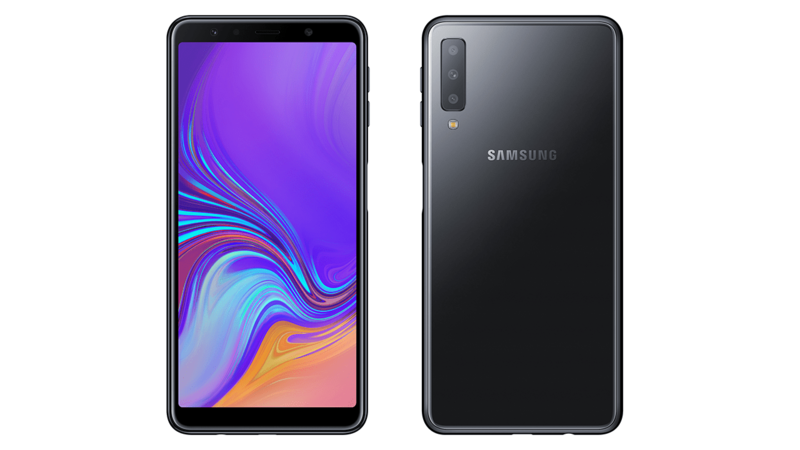 Talking about the specifications, the Galaxy A7 2018 has a 6-inch Full-HD+ display with a resolution of 2280 x 1080 pixels. Under the hood, there is a 2.2GHz Octa-Core Exynos 7885 processor with 4/6GB RAM and 64/128GB internal storage. The storage can be expanded up to 512GB via microSD card slot. Android 8.0 Oreo runs out of the box with Samsung’s Experience UI on top, and there is a 3,300mAh battery underneath. 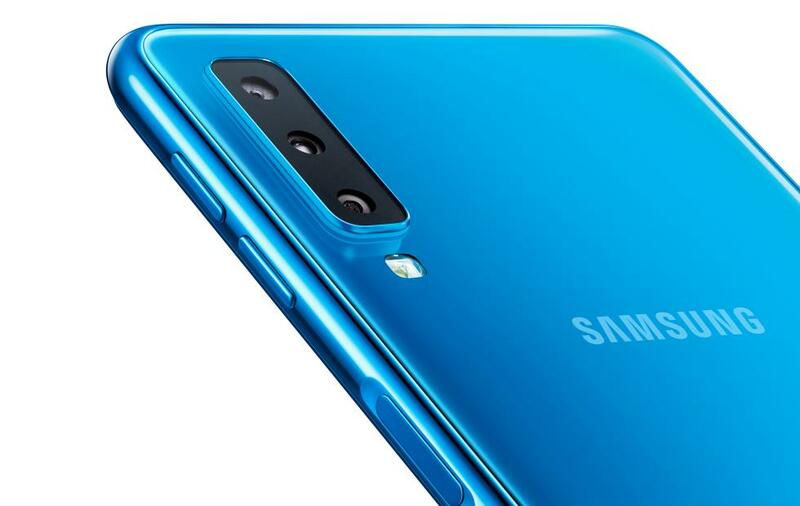 Coming to the main highlight of the Galaxy A7 2018, the cameras. On the rear, the phone has not one or two, but three cameras in total. The phone has a 24MP f/1.7 primary sensor, along with 8MP f/2.4 wide-angle lens and 5MP f/2.2 depth sensors. On the front, there is a 24MP camera with f/2.0 aperture. Some camera features include Scene Optimizer (Scene Detection), Bokeh Mode, Filters, AR Emojies etc. Some other features include Dolby Atmos, Bixby, Samsung Pay, Samsung Health, Bluetooth 5.0 etc. 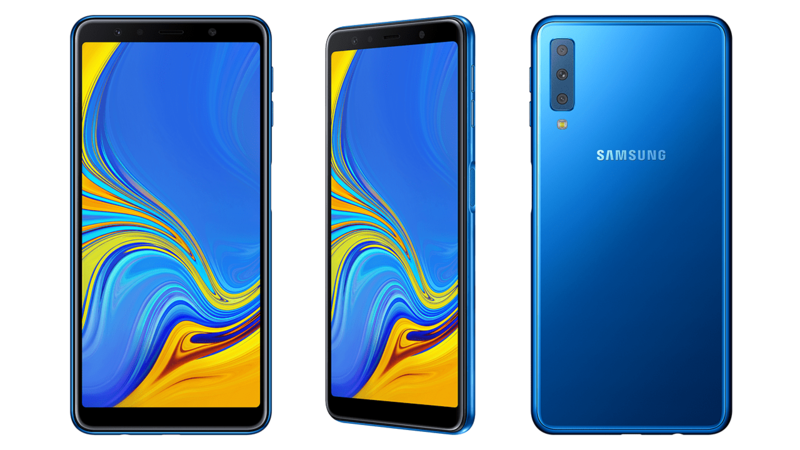 The Galaxy A7 2018 comes in Black, Blue, Gold, and Pink color options. Talking about the availability, Samsung said that the phone would be available in the selected European and Asian markets from this fall. There is no information about the pricing yet, but as per some sources, the price for Europe is going to be EUR 348 or $407.